My fourth book, Now a Geisha, is a dream project that was fifteen years in the making. It has finally arrived! The official release date is November 9, but it is already available for pre-order on Amazon.co.jp and will be in stock there on November 2. It should also be on bookstore shelves in Japan within the next few days. If you want a behind-the-scenes look at what happens on the day of geisha's erikae (the day she makes her debut as a geiko), then Now a Geisha is the book for you. The book covers the erikae of 3 geiko (Mameharu, Manaha, and Momifuku) in 2 of Kyoto's 5 geisha districts (Gion Kobu and Ponto-cho). Although the basic events of an erikae are the same in all 5 hanamachi, there are some differences, and you can see these contrasts clearly in the photographs. Now a Geisha is 192 pages and has 180 photographs, all in glorious color. But don't worry, we did not make the photographs small and hard to see. 78 of the photographs are either full-page or double-page spreads, so you can see every little detail. The book covers Mameharu's, Manaha's, and Momifuku's last month as maiko (2 chapters), the day of the erikae itself (4 chapters), and their first year as new geiko (1 long chapter). There is also an Introduction and an Afterword. 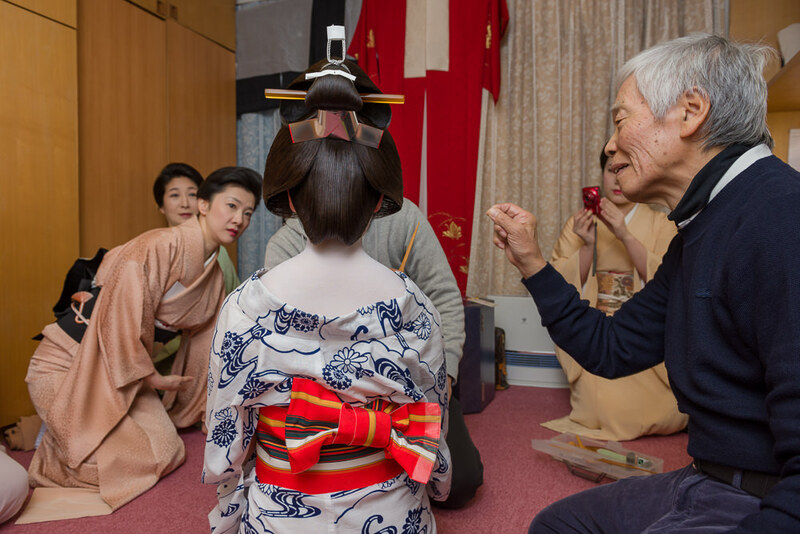 From the hairstyles yakkō shimada to sakkō to the makeup, katsura, and kimono, every step in a maiko's transformation into a geiko is covered in detail, step by step by step. There has never been a book about geiko quite like this. In addition to the 180 photos, there are also essays to accompany each chapter. As with my previous book, Geisha &Maiko of Kyoto: Beauty, Art, & Dance, I let the geiko speak for themselves as much as possible. My job as writer is simply to put their words in a context that people not very familiar with their world can understand and appreciate. Mameharu, Manaha, and Momifuku were all interviewed on multiple occasions for the book, and I also did in-depth interviews with the otokoshi who dressed Mameharu and Manaha, the katsura maker (Kyo Katsura Imanishi), and a Gion Kobu ochaya-san. As I said, this book took me 15 years to make, and I am now very, very excited to share it with you. You can purchase Now a Geisha at Amazon.co.jp now.